As observed in past surveys, respondents in Slovakia appear to be strongly averse to using trade credit in transactions with their business-to-business (B2B) customers. On average, around 27% of Slovakian respondents’ B2B sales value was made on credit (notably below the 40% average for Eastern Europe). Compared to one year ago, however, there was an average increase of 7% in the proportion of B2B credit-based sales in the country. The approach to B2B trade credit shown by respondents in Slovakia differs markedly from that shown by respondents in the other countries surveyed in Eastern Europe. In Poland, the B2B credit-based sales average (35%) is below the average for the region (40%), and the average in Turkey is aligned with it (40.3%). Slovakia appears to be the country least likely to grant credit terms in B2B trade (on average 27% of B2B credit sales were made on credit), while Hungary, at the other end of the spectrum, is the Eastern European country most prone to make use of trade credit in B2B sales (54% of the Hungarian respondents’ B2B sales were transacted on credit terms). Consistently with what was observed in the Czech Republic and Hungary, and in contrast to Turkey and Poland, respondents in Slovakia appear to have no preferences in offering credit terms to either domestic or foreign B2B customers. 27.0% and 26.4% of the total value of respondents’ domestic and foreign B2B sales were made on credit (averages for Eastern Europe: 42.9% domestic and 36.6% foreign). This suggests an equal perception of trade credit risk arising from either domestic or foreign B2B trade. This may be linked to the fact that Slovakia’s main export partners are its regional neighbours and the eurozone. Nearly 84% of the respondents in Slovakia (Eastern Europe: 85%) experienced late payment of invoices by domestic and foreign B2B customers over the past 12 months. This resulted in an average of around 48% of the total value of B2B receivables remaining outstanding past the due date (above the 43% average for Eastern Europe). Late payment occurred more often in respect to domestic than to foreign B2B invoices. Compared to last year, both the domestic and foreign default rates in Slovakia recorded an average increase of 4%, signaling a worsening in the quality of Slovakian respondents’ trade debtors. Late payment of B2B invoices in Slovakia (domestic and foreign) is reflected in the Days Sales Outstanding (DSO) figure posted by respondents. This averages 39 days (well below the 57 days average for Eastern Europe), is the lowest of the countries surveyed in Eastern Europe, and is five days longer than last year. Most Slovakian respondents (82%, compared to 66% in Eastern Europe) expect no change in DSO over the next 12 months. This may reflect a strong focus of Slovakian respondents towards the collection of high value, long-term outstanding invoices arising from B2B trade. Notably more respondents in Slovakia (around 28%) than in Eastern Europe (nearly 18%) consider maintaining adequate cash flow as the biggest challenge to businesses’ profitability this year. Cost containment is a reason of concern for more respondents in Slovakia (24.3%) than in Eastern Europe (nearly 17%) as well. These concerns are of no surprise for a country whose macroeconomic fundamentals are sound, and whose economy is forecast to grow 3.4% this year. Payment terms extended to domestic B2B customers by respondents in Slovakia average around 32 days from the invoice date (survey average: 30 days). Foreign customers are given slightly more relaxed terms, as they are requested to make payments on average four days later than domestic customers. Despite this, foreign average payment terms granted to B2B customers by respondents in Slovakia are the longest observed in Eastern Europe. Over the past year, payment terms extended by respondents in Slovakia to both domestic and foreign B2B customers increased by an average of five days. The slightly more lenient payment terms granted by respondents to their B2B customers determined a consequent increase in the average payment duration of overdue invoices. Particularly in the case of domestic past due invoices, the more lenient payment terms caused past due B2B invoices to be settled on average within one month past the due date. This compares to an average of 15 days for past due foreign invoices to be settled. Most respondents in Slovakia (around 73%) reported that late payment of domestic B2B invoices is most often due to customers’ liquidity issues (respondents in Eastern Europe: 64.4%). In line with the survey pattern, around 30% of Slovakian respondents (respondents in Eastern Europe: 33%) said that late payment of domestic invoices is due to customers’ intentional use of outstanding invoices for financial advantage. Also late payment from foreign B2B customers is most often attributable to customers’ liquidity issues. This was reported by markedly more respondents in Slovakia (54.7%) than in Eastern Europe (nearly 40%). Similarly, more respondents in the country (26.3%) than in Eastern Europe (21.3%) believe that foreign customers pay invoices late so that they use outstanding invoices for their financial advantage. As a consequence of B2B customers’ late payment, most of the respondents in Slovakia (around 30%, compared to 27.2% in Eastern Europe) reported that they had to postpone payments to their own suppliers. Nearly 21% of respondents in the country, compared to 14% in Eastern Europe, had to request a bank overdraft extension. This finding tallies with the earlier mentioned perception of cost containment as one of the biggest challenges that Slovakian businesses will be confronted with this year. More respondents in Slovakia (53%) than in Eastern Europe (45%) anticipate no change in their credit management tools over the next 12 months. This indicates that they are confident that the tools mix they are already using will protect their businesses against the risk of payment default. The proportion of B2B receivables reported by respondents in Slovakia as uncollectable (less than 1% of the total B2B credit sales value) is below that at regional level (1.2%). This finding tallies with those pointing to a strong focus shown by Slovakian respondents towards the collection of outstanding receivables. Uncollectable B2B receivables originated most often from customers belonging to the industries with which they primarily operate: construction, machines and transport. This reflects Slovakia’s high dependency on the automotive industry, which makes the country vulnerable to developments in this industry. The majority of respondents in Slovakia (around 64%, above the 55% of respondents in Eastern Europe overall) reported that B2B receivables were uncollectable mainly because the customer went bankrupt or out of business. 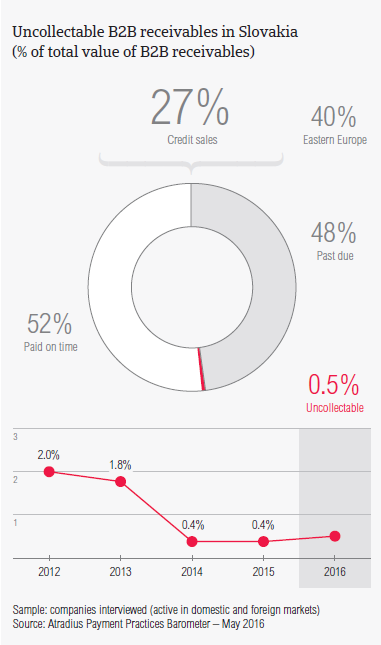 Interestingly, fewer respondents in the country (18%) than in Eastern Europe (nearly 34%) reported that B2B receivables were written off as uncollectable mainly due to the failure of collection attempts. This finding corroborates the strong focus on outstanding receivables collection commented earlier in this report. As mentioned earlier, survey respondents in Slovakia reported granting trade credit terms mainly to B2B customers in the construction, machines and transport industries. Invoice payment terms extended by Slovakian respondents to B2B customers in the machines and transport industries are significantly longer than the average payment terms observed in the country (40 days from the invoice date). B2B customers in the construction industry generated an above average (for the country) proportion of past due invoices. According to most of the respondents in Slovakia (around 70%), slow payment from B2B customers in all industries they chiefly trade with is most often due to liquidity constraints. It is particularly the transport industry, however, that most often uses outstanding invoices for financial advantage. This according to 43% of respondents in the country. Around 80% of the respondents in Slovakia anticipate no significant change in respect to payment practices of B2B customers in the machine industry over the next 12 months. Around 25% expect an improvement in the payment behaviour of B2B customers in the construction and transport industries. No significant change is expected in the payment practices of customers operating in the other industries surveyed.